The high-end phablet will supposedly come with the new Kirin 950 SoC. Will yet another Huawei phablet launch alongside or shortly after the Mate 8? 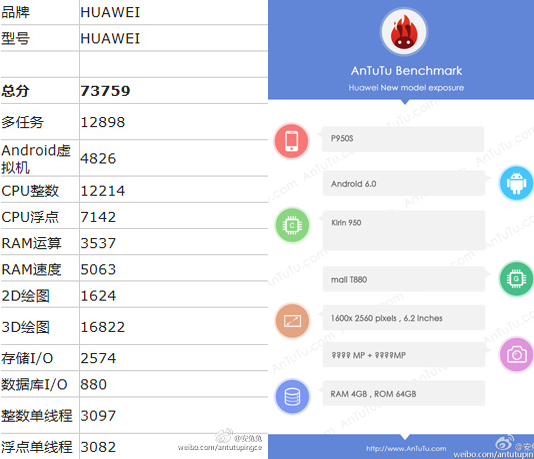 Leaked details from benchmarking application AnTuTu suggest that the P9 Max phablet may soon be ready for an official reveal. According to the source, the P9 Max (model P950S) will be a 6.2-inch phablet with a display resolution of 2560 x 1600 pixels. The device will supposedly ship with Android 6.0 and carry the recently announced 16 nm FF+ Kirin 950 SoC and integrated Mali-T880 MP4 GPU. RAM and storage space are expected to be 4 GB and 64 GB, respectively. Smartphones running Marshmallow are slowly creeping up the charts according to Google. 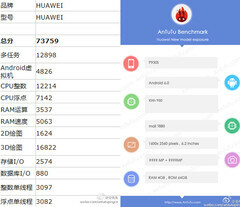 In AnTuTu, the alleged P9 Max scores just under 74000 points with a 3D score of about 17000 points. In comparison, Huawei claimed a top score of 83000 points for the Kirin 950 during its reveal. Huawei has been rising in the ranks worldwide. The Chinese manufacturer has surpassed Xiaomi in China and was selected by Google to manufacture the lauded Nexus 6P phablet.